Bharat Scientific World Established in the year of 2008, we "Bharat Scientific World" are a popular organization in the industry affianced in manufacturing, trading and supplying a wide variety of Laboratory Furniture & Instruments. Offered products are optimum in terms of quality and provide high performance at patron end. These products are highly demanded by the clients for their reliable performance and sturdy construction. 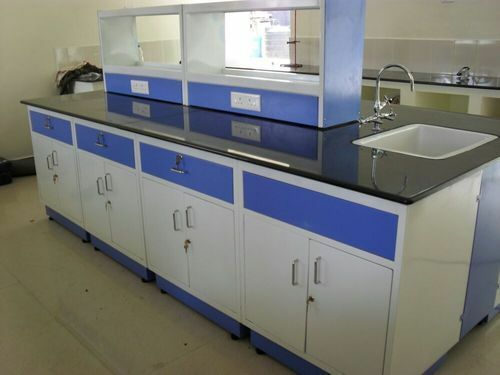 Our offered product array consist of New Items, Research Lab and Industry Products and Laboratory Furniture. Provided products are manufactured by using supreme grade components at our end. We are offering these products in various stipulations to choose from. We have established a well-equipped infrastructure facility. Our infrastructure facility is equipped with all the required machines and tools for the manufacturing of the offered products. For interrupt free process of our business, we have divided our facility into various parts. To manage these differentiated parts, we have chosen a team of trained professionals. Owing to our upgraded infrastructure and highly efficient team members, we have been able to cater the bulk demand given by our patrons in timely manner. Backed by a well-established distribution network, we have been capable to dispatch the offered products safely at client end within the assured time period. Under the firm direction of our mentor Mr. Anil Mahajan, we are operating our business function in a progressive and productive manner. His vast experience and knowledge of this field enable us to reach on this growth path. ORP (Oxidation-Reduction Potential) is a term used frequently in the water treatment & food processing industry. It is a measure of the cleanliness of the water & its ability to break down contaminants. ORP sensors work by measuring the dissolved oxygen i.e. if contaminants in the water are more it results in less dissolved oxygen because the organics are consuming the oxygen and the ORP level is low. The higher the ORP level, the more ability the water has to destroy foreign contaminants such as microbes, or carbon based contaminants. ORP level can also be viewed as the level of bacterial activity of the water because a direct link occurs between ORP level and Coli form count in water. This instrument is ideal for testing liquids like natural water, drinking water, treated water, waste water, brine solution, sea water and soluble salt content in liquids.